Ah 4K. Our smartphones aren’t what they used to be a couple of years back, and as time progresses, we see more and more ‘innovations’ and specifications upgrade head our way. Whether it be processor architecture, manufacturing process, the number of cores or just raw frequencies, today’s gadgets out do what desktop computers could have done back in the day. Screen resolutions aren’t the same either, and manufacturers are busy squeezing as much pixels as they can in that tiny amount of space to make sure no detail is missed – and to secure a sizable chunk of your wallet as well. While our eyes have just started to grow comfortable with the notion of 2K displays, that hasn’t stopped manufacturers from pushing the ppi barrier as far as they possibly can. While most consumers and users believe that when it comes to smartphone displays, ‘simple’ QHD is quite enough, EverDisplay would like to disagree. 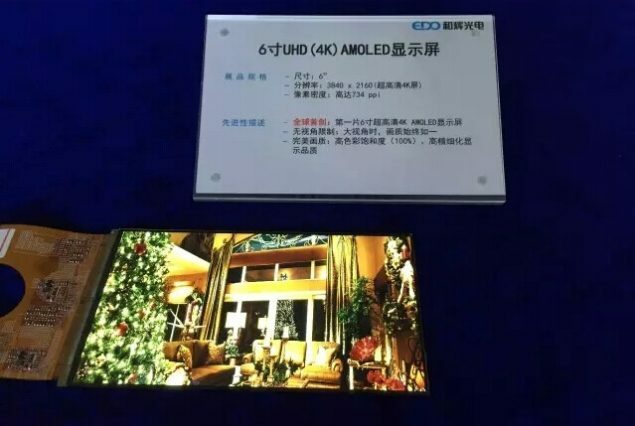 Today, the manufacturer has showcased the world’s first 6 inch 4K display panel, which comes at a pixel density of 734 ppi. What’s the reason for this insanely high pixel density and resolution? EverDisplay claims that this will help in future virtual reality applications and 3D imaging, which are quite far from mainstream smartphone adoption right now if you ask us. The manufacturer has been involved in several other spheres as well, which include round displays for smartwatches and even the automative industry. Apart from its size and resolution, little details are available about market availability and such. But adoption of 4K displays on smartphones will come with its fair share of complications. The first of these is battery life, which is one aspect that always proves to be insufficient, given that manufacturers also have to cater to device thickness and make sure our smartphones aren’t just large bricks. So we’d expect it to be quite a while until this bears fruition and till then, stay tuned and let us know what you think in the comments section below.